Football at Davidson began during the late 1880’s in the form of club ball. 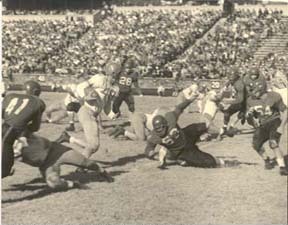 The rules for the game of football were still being standardized, so the teams met before every game to set the rules straight for that particular contest. The first uniforms for the club were dark sweaters or canvas jackets with “DC” chalked on the front. The team may not have looked good and been very organized, but they played hard. Finally, in October 1898, the faculty allowed Davidson students to participate in intercollegiate football games. The first intercollegiate game was played on November 5, 1898 against the University of North Carolina. The game was so big that a special train was chartered to take the entire school into Charlotte to cheer the team on. Luckily for the players, the school colors were changed by the student body in 1895 from pink and blue to red and black. 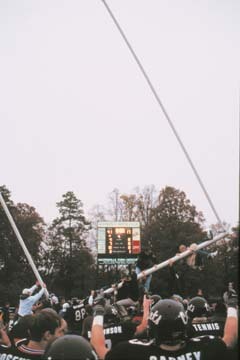 The team lost 11-0, but the editorial in the Davidson College Magazine was entitled “Victory in Defeat” (Gillespie 22). Davidson football had officially begun. In 1917, the nickname we now have at Davidson was officially adopted. Formerly nicknamed “the preachers”, Davidson became known as the Wildcats after some Georgians commented that the team—undersized, scrappy and tenacious—“fought like wildcats” against Georgia Tech. Another interesting thing occurred in 1929. In a 13-12 win over Duke, senior captain Thad Brock faked a punt seven yards deep in his own end zone. He ran and scrambled around the entire Duke defense to be awkwardly brought down five yards before Dukes end zone. The 102 yard run was featured in a Ripley’s Believe It or Not on September 17, 1930. It was known as the longest and “nerviest” non-touchdown play ever (Charlotte Observer 7B). The Board of Trustees responded to these issues by requiring all Davidson schedules to be adjusted according to the size and strength of the opponents. 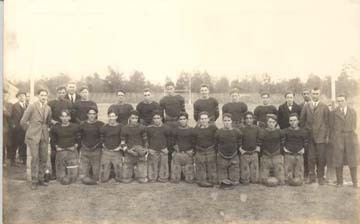 In 1936, the football team joined the Southern Conference to help meet the Boards’ scheduling requests. Scholarships were denied authorization, but financial aid was allowed for athletes that met certain Davidson standards. Davidson was steering away from creating a state-school football atmosphere. Instead, the student-athlete tradition would continue. In 1980, the Davidson football team experienced its last winning season for a long time. From 1981-1989, the ‘Cats went 14-78. Four games were won from 1985-1989, and the team went winless in ’86 and ’88. This led to a major decision on November 29, 1988. The trustees voted to move the football program into NCAA Division III, eliminating all football scholarships. Many players threatened to transfer, and some thought that the team would not have enough players and coaches to even have a season the following year. Davidson then moved into the NCAA Division I-AA Independent League on a non-scholarship basis. and led the ‘Cats to their first undefeated season in school history with a perfect 10-0 record. Susan left immediately after his successful season and was replaced by Coach Mike Toop, who led the team to an impressive 7-3 season in 2002, the team’s second season in the Pioneer Football League. In 2003, Stephen B. Smith ’66 selflessly gave the football program a grant of two million dollars. Davidson football has come a long way and still has a long way to go. From Ripley’s Believe It or Not appearances to perfect seasons, the Davidson football team has been filled with character throughout the years. Where the program goes from here is unknown, but it will always carry the strong tradition of having quality student-athletes who step up to all the challenges they are faced with. National attention”. The Davidsonian. 9 December 1997. 5. 1962. RG 8/7.1. Davidson College Archives, Davidson, NC. Garfield, Matt. “Three ESPN games highlight another challenging schedule”. Wildcat Report. Fall 2003: 10. Helfrich, Tim. “Cooke Gets 200th Win as Coach.” Lake Norman Times. Howard, Hinds. “Baseball Moves into New Clubhouse.” Davidsonian. Kerr, James W. “The Start of Soccer at Davidson”. Unpublished article. Soccer Davidsoniana file. Davidson College Archives, Davidson, NC. Lanoka, Andy. “Slagle Marks 20 Years of Dedication to Davidson Athletics”. Madden, Erica. “’New’ players excited to hit the hardwood”. Photograph of 1909 Basketball Team. “Athletics”. Quips and Cranks. Program. February 18, 1964. 3. Of Trustees. March 1992. RG 7/1.1. Admissions. Davidson College Archives. Observer. November 12, 1987. 7c. William J. Martin. Davidson College Archives. Davidson, NC. Davidson History”. Summer 1989: 4. Track of the Cat. “Continuity in Coaching: The Year of the Milestone”.